INTRODUCTION: Radiography is a key diagnostic tool in paediatric care. A pro-active approach (including the use of radiography) is required to ensure effective management of these patients. Taking into account the widely documented harmful effects of ionising radiation and the small organ masses of neonates, the number of radiographs that neonates receive during hospital admission is of particular concern. A reduction in radiation exposure tailored to specific indications would be advantageous. The aim of this study was therefore to establish a profile of indications for radiographs in the Neonatal Intensive Care Unit at Universitas Academic Hospital, Bloemfontein, South Africa. METHODS: A retrospective, descriptive study was conducted over a 1-month period (8 September - 8 October 2010). Information was obtained from the online Medi-Tech system used to request radiographs. RESULTS: A total of 469 radiographs were performed on 51 neonates. Twenty-seven male and 24 female neonates received 226 (48.2%) and 243 (51.8%) radiographs, respectively. The radiographs were classified into routine (91.9%) and urgent (8.1%). Chest radiographs were requested most frequently (59.5%). The most commonly recorded indication was prematurity (37.1%), followed by respiratory-related indications (28.5%). The highest number of radiographs performed on a single neonate was 46. CONCLUSIONS: All radiographs were requested online, supporting the validity of the study with regard to the number of radiographs performed and their respective indications. A representative profile of indications was successfully obtained, which can assist with the implementation of further research on the stratification of radiation exposure according to indications for radiographs. Conventional portable radiography remains a key diagnostic tool for effective, pro-active management in neonatal intensive care, because of potentially lower radiation exposure and cost considerations compared with more sophisticated imaging techniques. It is used for initial patient evaluation, when clinical deterioration has occurred, or in specific clinical situations such as after intubation or umbilical line placement. In a study reported by Spitzer et al., routine screening chest radiographs were found to be significantly beneficial in one-third of the neonates, identifying, among other things, potential pulmonary problems before patients' clinical status deteriorated. According to the European Commission's guidelines on quality criteria for diagnostic radiographic imaging, justification - a valid clinical indication, irrespective of the quality of the imaging procedure - is the first consideration in radiation protection, particularly in paediatric patients. It was concluded from an audit of cancers attributable to ionising radiation exposure in the UK in 2010 that diagnostic radiology is the most important source of ionising radiation in the UK population. The biological effects of low doses (<100 millisievert (mSv)) of ionising radiation are still a subject of debate. Risk assessments are complicated by the fact that human beings have a relatively high natural cancer risk (25 - 33%) and are exposed to natural background radiation, which varies between populations. Even large epidemiological studies will not provide reliable excess risk factors for low doses. It is therefore necessary to use the linear no-threshold hypothesis, which states that cancer risk from low linear energy transfer doses increases proportionally as the radiation dose increases, as extrapolated from the risks of higher doses. Risk-benefit evaluations with regard to the use of diagnostic ionising radiation are not easy to make, since many confounding factors influence the estimated effective dose and therefore the risk of cancer following radiation exposure. These confounding factors include body mass, age and gender. For example, females are more sensitive than males to the carcinogenic effects of radiation to the thyroid. The age-dependent cancer mortality risk coefficient, average effective dose for the type of examination and any identified genetic risks (in younger patients) should be used to determine the individual radiation risk from an examination. Evidence of an increased risk of mortality for all cancers, excluding leukaemia and lung cancer, has been reported with increasing radiation doses. Very young children are 3 - 4 times more sensitive to ionising radiation than adults. Although children take in smaller amounts of potentially contaminated food and air than adults, radioactivity is more concentrated in their small bodies and has a greater turnover owing to a higher metabolism and uptake in growing organs. Children may be more susceptible to radiation-induced cancer due to tissue growth, since dividing cells are more susceptible to somatic genetic damage. [5,9] Although the radiation dose for one procedure may be low, paediatric patients are often subjected to multiple X-rays to evaluate their progress and may even require therapeutic radiation later in their lives. Despite the total radiation energy imparted being less in smaller patients, the organs are also smaller, which influences the effective organ and patient doses. Children's organs are also more sensitive to radiation. The small size of neonates brings their organs closer to the useful beam, which results in a higher exposure to effective dose conversion factor per radiograph than in adults. Children (especially females) also have a potentially long life expectancy with a large window of opportunity for cancer-related complications to develop,[5,10,12] emphasising the vulnerability of neonates to the effects of ionising radiation, although they are exposed to much smaller amounts of radiation. Many neonates admitted to neonatal intensive care units (NICUs) are preterm infants requiring special care, which includes multiple radiographs per patient. Over the past decade, premature delivery has been increasing in Western countries, with nosocomial infections, anaemia due to multiple blood tests, and ionising radiation being documented as the most common iatrogenic factors in NICUs. Technological advances, including diagnostic radiography, have increased population exposure to ionising radiation and may be an important factor contributing to the increased incidence of thyroid cancer in many parts of the world over the past few decades. The child's thyroid gland is recognised to be one of the most radiosensitive organs. The principal factor contributing to total body dose of radiation in neonates could, according to reports, be the number of radiographs performed. However, in another study it was found that radiation doses received by even the sickest infants weighing less than 750 g did not approach the level thought to be associated with a risk of radiation-induced carcinogenesis. A survey conducted over 18 months in a special-care baby unit in the UK demonstrated that the mean entrance dose per neonate was low, although some neonates received a high dose owing to the high number of radiographs requested. Rigorous collimation was not always performed and radiation exposure could be limited by placing an adjustable collimator made of lead on top of the incubator. According to Bader et al., the gonads of both sexes were unintentionally exposed in radiographs performed in NICUs during a 1-month period. In male neonates, the testes were exposed in 31% of abdominal radiographs and in 34% of abdominal and chest radiographs. The most important question before performing an examination should be 'Will I get information that really influences the treatment of the primary disease?' Information regarding management-related complications could also be added here. In the compilation of imaging algorithms for the most commonly encountered paediatric disorders, optimal patient preparation and comprehensive information on request forms could facilitate limitation of radiation doses. The aim of diagnostic imaging should be adequate image quality and not optimal image quality. The European Commission has provided guidelines to assist with the optimisation of diagnostic radiographs in paediatric patients to limit the radiation dose. These guidelines include the quality control of X-ray imaging equipment, the use of low-attenuation materials, patient positioning and immobilisation, limitation of field size and X-ray beam by using beam collimation, protective shielding, optimal radiographic exposure conditions, the use of higher-speed classes of screen film systems, number of radiographic exposures per examination, film blackening and processing, viewing conditions, and analysis of rejected radiographs. After taking all the above information into account, we postulated that standard radiation dosages could be reined in alignment with these indications. For example, when pathology has been excluded by the first radiograph, the number of radiographs performed to determine the correct positioning of lines can be reduced. The aim of this study was to establish a profile of indications for radiographs performed on neonates admitted to the NICU at Universitas Academic Hospital, Bloemfontein, over a 1-month period (8 September - 8 October 2010), to elucidate the most common indications for neonatal radiography and direct further research in this ield in the Faculty of Health Sciences at the University of the Free State (UFS). This was a retrospective, descriptive study. Information regarding all radiographs performed on neonates in the NICU at Universitas Academic Hospital during the selected period was included. Clinicians in the NICU used the online Medi-Tech system to request radiographs. The request forms were printed by the Department of Radiology and collected in a sealed box. The researchers collected the data forms and completed a checklist specifically designed for this study. After a 1-week pilot study that included 80 forms, minor adjustments were made to the checklist. Results from the pilot study were excluded from the analysis of data acquired in the main study. The checklist consisted of two parts, with part A collecting information on the neonates' initials, gender, age in days and hospital identification number, as well as the date and time the radiograph had been performed. In part B of the checklist, priority rating of the radiograph (routine or urgent) was recorded, as well as the view requested and the reason for requesting the radiograph. Routine radiographs were regarded to be the radiographs performed as part of the standard practice protocol of the unit, for example to follow up on the placement of lines or therapy for pulmonary infections. Urgent radiographs were radiographs that had to be performed as soon as possible in order to ensure optimal management of the patient. Data analysis was performed by the Department of Biostatistics, UFS. Results were calculated as frequencies and percentages. Approval to conduct the study was obtained from the Ethics Committee of the Faculty of Health Sciences, UFS. The Committee did not deem informed consent from the neonates' parents to be necessary, since all information would be treated with confidentiality by using a number coding system. Information remained confidential throughout the study and the printed data sheets were returned to the Department of Radiology for safekeeping. Neonates' surnames were recorded but remained confidential owing to the number coding system used for capturing data. Permission for the investigation was also obtained from the respective heads of the departments of Radiology and Paediatrics and Child Health, as well as the Head of Clinical Services at Universitas Academic Hospital. Fifty-one neonates were included in the study, of whom 27 (52.9%) were male. Over the 1-month period of the study, a total of 469 radiographs were performed on this group of neonates, 226 (48.2%) of whom were male and 243 (51.8%) female. With further analysis of data, we found that a mean number of 9.9 radiographs were performed per male neonate and a mean of 10.1 radiographs per female. Overall, the mean number of radiographs per neonate was 9.2. With regard to age, the neonates were divided into four groups at the time of the specific radiograph, namely 0 - 8 days, 9 - 16 days, 17 - 24 days and ≥25 days. The number of radiographs performed per age group is shown in Table 1. 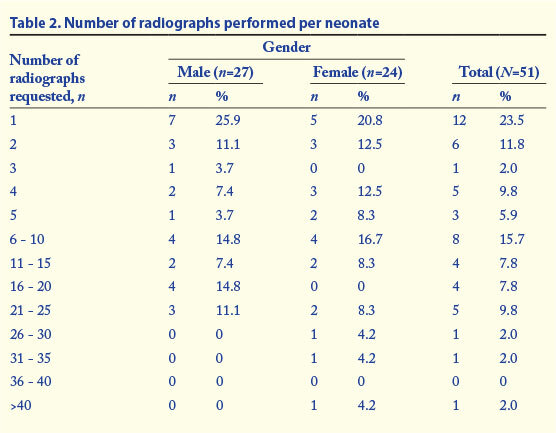 Table 2 shows the number of radiographs performed per neonate. Twelve neonates received only one radiograph. The highest number of radiographs performed on a single neonate was 46, followed by 31 radiographs performed on another. Both these patients were female. Cumulatively, the median number of radiographs performed per neonate was 5. Nineteen radiographs were performed on newborn babies up to 3 days of age, which accounted for 4.1% of all the radiographs performed. With regard to the priority rating of the radiographs requested, 38 (8.1%) were indicated as urgent, while the remainder (431, 91.9%) were routine. Urgent radiographs were performed immediately, as they were regarded as indicated for investigation of a serious clinical situation. The majority of routine radiographs were performed at 06h00 or 18h00, but some routine and all the urgent radiographs were performed at other times. Chest radiographs were requested most frequently (279 times, 59.5%), followed by a combination of chest and abdominal radiographs, which were performed 132 times (28.1%). Data on the radiography views requested are shown in Fig. 1. A list of 18 common indications for neonatal radiography was included in the checklist, although clinicians could also specify an unlisted indication. This list was compiled with the assistance of the head of the NICU (personal communication). Of the 469 requests for radiographs, 233 (49.7%) included indications other than those included in the checklist. As more than one indication could be selected per radiograph, the number of indications exceeded the total number of radiographs performed. Table 3 summarises the indications provided by doctors for the radiographs performed on neonates. Thirty-two additional indications were identified for which a radiograph was requested, which were then grouped into related categories. Of these indications, respiratory reasons were the most common, appearing on 75 radiography requests, followed by sepsis on 74 requests. Gastrointestinal reasons were noted as the indication for 61 radiography requests, in most cases being necrotising enterocolitis and hernias of the diaphragm. 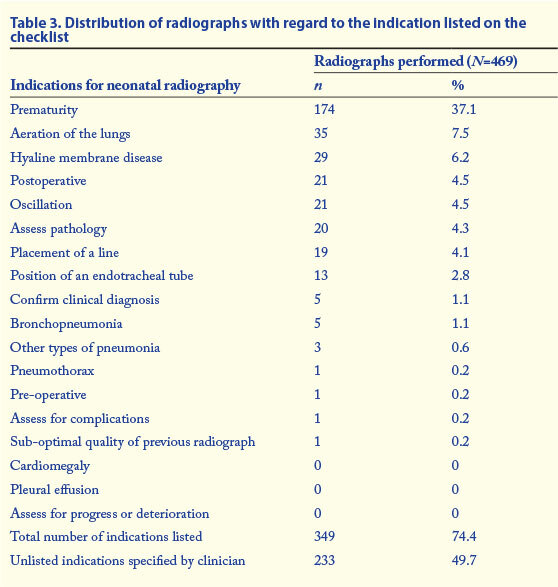 The distribution of radiographs performed in the various categories of additional indications is shown in Fig. 2. Eighteen radiographs did not fit into the proposed categories and were grouped as 'other'. Female neonates received slightly more radiographs than males. Female neonates are more susceptible than males to radiation-induced gonadal cancers, and the undescended ovaries are still in the abdominal region. The brief duration of the study precludes any definite conclusions regarding the mean number of radiographs performed per female neonate over longer periods of time. 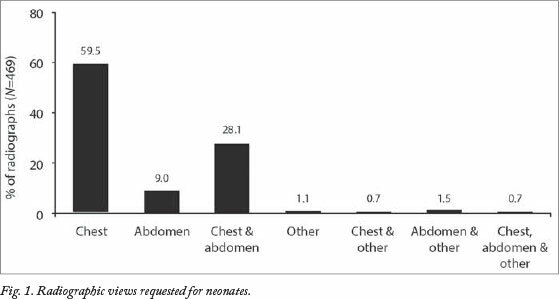 Chest radiographs were requested most frequently, which could be ascribed to the fact that respiratory-related problems are common in premature neonates. Taking into account the number of chest and abdominal radiographs requested in this study, it is imperative that the neonate's pelvis be shielded. 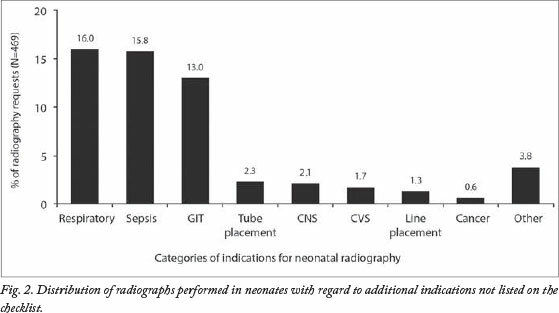 Prematurity was the most frequently selected indication for requesting radiography in neonates, followed by respiratory reasons and sepsis. The latter, however, is very vague and needs to be more specific. The number of radiographs performed for placement of a line and/or positioning of a tube (49, 11%) was lower than the researchers expected. The 3 suspected cases of cancer for which radiography was performed were teratomas. With regard to cancer-related concerns, our study can be compared with research conducted in Brazil in 2004. From the records of preterm infants admitted to a neonatal unit of a public hospital, it was found that in the neonates exposed to most radiation, the liver, breast and stomach were the organs at highest risk of developing cancer. On average, 3.9 chest/ abdominal radiographs were performed per preterm neonate over a mean period of hospitalisation of 16 days. One of the patients was subjected to 50 radiographs during a 137-day hospitalisation. The mean doses of radiation to the gonads and thyroid were also relatively high. It was concluded that accurate collimation of the X-ray field and utilisation of lead shielding in the incubators or collimator lead shields could reduce the dose to these organs. It is difficult to make direct correlations between radiation exposure in the neonatal period and the development of cancer. Radiation-induced cancer may only become apparent decades after radiation exposure and includes most forms of leukaemia, skin cancer and cancers of solid organs, such as the lung, breast and thyroid. [8,22] Typically, the lag period between radiation exposure and the diagnosis of cancer is at least 5 years. A significant number of peripherally inserted central catheter lines migrate within 24 hours after placement, necessitating additional radiographs. Although ultrasonography can be used as an adjunctive measure for confirmation of optimal line placement, it appears that chest and abdominal radiographs are still extensively used to ensure correct line placement. In a review of the literature, Sneath reported a lack of information regarding the best method for confirmation of placement of peripherally inserted central catheters. Ultrasonography could be a successful alternative in more than 75% of cases, and the judicious use of radiographic contrast media could further decrease the number of radiographs required. Patient positioning should also be taken into consideration in the accurate interpretation of line placement. Guidelines regarding patient positioning may be of value in trying to limit the number of follow-up radiographs required. Based on our findings, we propose that indications for radiography in neonates in our unit should be standardised and more specific. The profile of indications should be compared with that of NICUs of other healthcare facilities in South Africa and globally. Similar studies should be conducted over a longer time period in order to establish a more representative profile of indications and identify differences with regard to gender. The departments of Radiology and Medical Biophysics could perform more detailed studies regarding radiation dosages and stratification thereof, with the possibility of reducing the dose. Further research is required to determine the minimum adequate amounts of radiation required for different indications and to compile realistic algorithms to assist the doctors who request radiographs. Despite the continuing debate with regard to the beneficial effects of low-dose ionising radiation, we are of the opinion that minimising the doses of ionising radiation to which neonates are exposed will be to their advantage, taking into account the widespread increase in the use of diagnostic radiation techniques. Practical guidelines have been provided by the European Commission in this regard. More research on the efficacy of ultrasonography as an alternative diagnostic instrument in neonatal medicine should be considered, and large patient populations are recommended for such studies. It would also be advantageous if a centralised electronic record of all ionising radiation investigations could be set up for each newly born infant in South Africa. This would extend over a person's entire lifetime, similar to the registry kept for persons occupationally exposed to ionising radiation, to facilitate future epidemiological studies and monitor radiation exposure. Acknowledgments. Professors Coert de Vries, Department of Diagnostic Radiology, Charles Herbst, Department of Medical Biophysics, and Beyers Hoek, Department of Paediatrics and Child Health, provided valuable advice to the researchers. Professor Gina Joubert and Mr Cornel van Rooyen, Department of Biostatistics, assisted the authors with the research protocol and statistical analysis of data. Dr Daleen Struwig, medical writer, Faculty of Health Sciences, is acknowledged for technical and editorial preparation of the manuscript.